Our proposed school building would have smart class rooms with smart board. 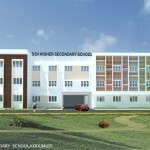 The proposed new building consists of 27 class rooms for 6th to 12th standard in the measurement of 22.0 ×26.0 feet each. Our new building consists of 6 separate laboratories for Physics, Chemistry, Biology, Computer Science, Language and High school in the measurement of 26.0 ×44.4 feet each. And also it consists of separate rooms for HM, AHM, JRC, NCC, NSS, Scout and Games in the measurement of 22.0x 26.0 feet each. It has an Office room and a Record room in the measurement of 22.0 ×26.0 feet each. It consists of Separate staff rooms for ladies and gents in the measurement of 22.0 ×26.0 feet each. A beautiful lobby is located in between the office and the record room in the measurement of 22.0 ×26.0 feet. In today’s competitive world, education has become very innovative. To fulfil the needs of the students for the present situation, we have smart classes in our new proposed school building. The smart classes have all the latest facilities and technologies regarding with education. We propose to provide world-class education in our village school.